Valmont Irrigation has introduced the TouchPro control panel with touch technology to the global market. The Valley TouchPro is designed to simplify control panel programming, while giving growers the option to personalize main screen controls to display irrigation information that is important to their operations. “The TouchPro control panel has naturally evolved from the current computerized panels,” said John Rasmus, Valmont Irrigation Product Manager. The TouchPro has improved control features, including a graphical view of the center pivot, endgun positions, and wide boundary irrigation positions. The new interface helps growers make water management decisions more quickly and confidently. The TouchPro is compatible with the Valley BaseStation2-SM and Tracker product line. It is currently only available in English. 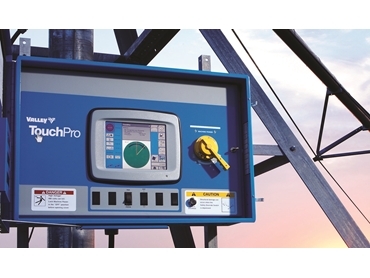 Unlike other touch control panels on the market, the TouchPro from Valmont Irrigation is designed to handle the harsh agricultural elements, including extreme temperatures, high humidity, and transient voltage requirements. These design specifications will provide growers with uninterrupted performance and years of trouble-free operation.